Chastened by her exhausting persecution as First Lady, HRC apparently decided as a member of Congress to go along to get along. 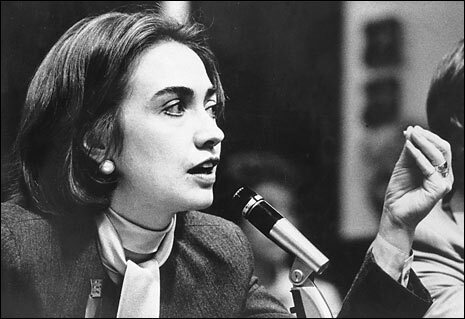 Recent Yale law grad Hillary Clinton testifies in 1974 as a member of the impeachment inquiry staff during the Watergate Scandal. The former First Lady, Senator, and Secretary of State no doubt concurs with the nineteenth century French politician who said (more or less): “If a person is not a socialist at 20, he has no heart. If he is still a socialist at 50 he has no head.” Of course, idealism is impractical, an unaffordable luxury for career politicians, who must learn to play ball with the powers that be if they wish to survive in public life. And HRC is a political survivor par excellence. Marrying Bill Clinton and moving to Arkansas, Hillary Rodham learned the art of compromise, beginning her own metamorphosis into the corporate entity, HRC. When Clinton ran for president in 1992, kicking off a long national soap opera, HRC learned to lie in public on venues like 60 Minutes. Heading the Clinton White House Task Force on National Health Care Reform, HRC suffered an embarrassing public defeat at the hands of entrenched health care and insurance interests and their congressional minions. HRC’s principled activism as First Lady was muted by the rabid efforts of Independent Prosecutor Kenneth Starr to implicate her in one scandal or another: Whitewater, Vince Foster, Travelgate, or Filegate. Despite Starr’s marathon efforts, at huge public expense, no charges stuck. Both Clintons, but especially HRC, infuriated their Republican opponents with an intensity not seen since the days of Franklin and Eleanor Roosevelt, like their later blinding hatred of Barack Obama. HRC’s gender seemed to be the real problem for conservatives, like Obama’s race, challenging and offending the white male power establishment. Ultimately Starr’s pursuit proved superfluous. Bill Clinton’s libido sabotaged his presidency more effectively than any of his many foes. As the sordid saga of the President’s dalliance with an intern led to his public humiliation and impeachment, HRC’s public approval ratings shot up to 70 percent. She seized an opportunity to get out from under her husband’s shadow and make her own way. Running a smart, incredibly expensive campaign, blessed with weak opposition, HRC was elected to the Senate from New York. Chastened by her exhausting persecution as First Lady, HRC apparently decided as a member of Congress to go along to get along. During her first term in office she voted for every bellicose bit of war legislation the Bush administration saw fit to ram down the throats of the American people in the wake of 9/11: military action against Afghanistan, the Patriot Act, the Iraq War Resolution. Not until her second term, when the deadly, misbegotten blunders of the Bush-Cheney junta became apparent to all but the most unregenerate jingos, did HRC modify her war support. By then it was too late. Hillary checks her email, 2011. HRC also criticized Bradley Manning for his disclosures of U.S. war crimes and illegal State Department collusion with foreign oil companies. Of Edward Snowden, she said, “I don’t understand why he couldn’t have been part of the debate at home… because we have all these protections for whistleblowers.” But President Obama, while promising to protect whistleblowers, has prosecuted more leaks of classified information than all previous administrations combined. 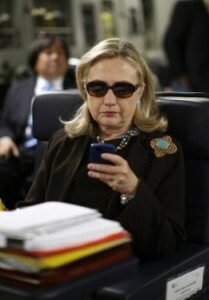 HRC’s disingenuous remarks about Snowden reveal either her own ignorance or her assumption of ours. HRC’s successor, Secretary of State John Kerry, accused Snowden of helping terrorists and endangering lives. Kerry told him to “man up” and return home. The brave young Vietnam war veteran, who tossed his medals on the Capitol steps and told the Senate Foreign Relations Committee, “How do you ask a man to be the last man to die for a mistake?” was another idealist later betrayed by his older, long-embedded, sold-out soul. Regarding war and civil rights, Hillary Rodham and HRC share scant common ground. The heart of the 22 year-old liberal lies buried deep beneath the travel-worn head of the 66-year-old pragmatist. In 2008 Barack Obama promised Hope and Change. But he failed to deliver. As would Hillary. HRC holds an appeal for voters who want the first female president. But President HRC would practice the very “politics as usual” that the first Wellesley student commencement speaker challenged to change. Read more of James McEnteer’s articles on The Rag Blog. This entry was posted in RagBlog and tagged 2016 Elections, Electoral politics, Hillary Clinton, James McEnteer, Political Compromise, Pragmatism, Rag Bloggers. Bookmark the permalink. I seem to recall some very similar statements made about six years ago (mostly by anarchists) prior to the “election” of Barack “Far Beyond Hopeless” Obama. There’s an old saying: Fool me once shame on you, fool me twice shame on me, and fool me over and over and over again and I’ll end up as Satan’s little piece of chicken in hell. The same book also noted that Hillary Clinton’s “favorite poli-sci professor” at Wellesley College was a man named Dr. Alan Schechter and that Schechter said that “Hillary was never radical.” So her post-1974 record of practicing “politics as usual” shouldn’t be that surprising. True, Bob, that Hillary grew up in a Republican family and supported Goldwater. But then, so did a number of folks I knew in SDS. And you leave out the fact that she and Bill were major organizers in George McGovern’s insurgent anti-war candidacy. The point is not whether she was a lefty, but that the early Clinton was at least largely driven by idealism. It is her path from idealism to cynical pragmatism that James describes. Her idealism stage seemed to reflect 1960s National Student Association-type politics rather than the type of Movement/counter-cultural, anarcho-left libertarian politics the ex-Goldwater supporters in SDS tended to express, I think. And as Dave Dellinger indicated in his “From Yale to Jail” autobiography (p. 401-402), after observing how McGovern’s campaign organizers operated during the 1972 DNC convention, ” Abbie Hoffman, Jerry Rubin and Ed Sanders” and “most of the other Movement people I knew who had been planning to campaign and vote for McGovern decided not to.” And Abbie and Jerry also wrote in their 1972 book “Vote” that “women were…furious that McGovern pressured delegates to vote against abortion reforms on the platform…,” etc.